With 193 300 and 301 Siemens has delivered the first two Vectron locomotives to Deutsche Bahn. To DB Cargo Deutschland to be more precise. Earlier this year the rail operator decided to order sixty such locomotives, of which five could be delivered on very short notice. The 193 300 and 301 are both ‘Trans-Alp’ locomotives with DE/AT/CH/IT/NL package. On 11.12.2017 these machines ran from Munich to Oberhausen together. Soon Deutsche Bahn will also receive the 193 302-304, which have been seen during test runs over the past days. That the ‘300’ locomotive is a DB locomotive now, explains why Siemens started a new number batch for ELL. After 193 299 came the 193 721. 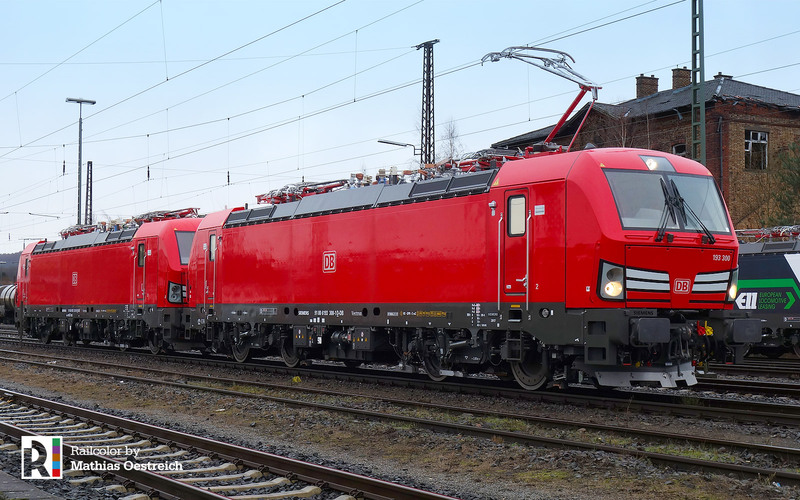 These machines are not the first Vectrons for Deutsche Bahn, as DB Cargo Polska and DB Cargo Italia already deploy such locomotives, althought are pure DC machines for the corresponding domestic markets.